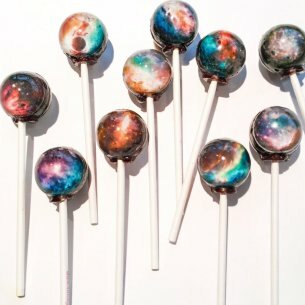 The Galaxy Lollipops Series is edible art with amazing clarity. These "Galaxy Lollipops" will make you feel as if you're holding the beautiful nebulas in your hands. These will make a beautiful and delicious gift for a special someone. It comes in our specially designed Galaxy Lollipops gift box. Nature is the penultimate inspiration, and space its widest and most expansive form. The Sparko Sweets line of Galaxy Lollipops comes from the imagination that only the heavens can create. From the Northern Lights to the planets of the solar system to the mysterious nebulas that hold the dreams of us all, Galaxy Lollipops pays homage to the natural inspiration of space through its Sparko Sweets line. We wanted a fun name that spoke to the adventure that our product gives you: Sparko because of the spark you get when looking at the design, and Sweets for how it tastes once you finally decide to stop looking! Here's the best part - you get an entirely new perspective of the universe around us with each and every Sparko Sweets Galaxy Lollipop that you order. No two batches are completely the same. No two lollipops are completely the same. Each treat is handcrafted using real photographs of the universe as its inspiration. You are literally eating a new piece of candy that is completely unique to the universe every time you order a lollipop from us. Enjoy Cosmos Designs, Universe Designs, Galactic Designs, Stars Designs, Nebula Designs, Spiral Designs, Northern Lights Designs, Planet Designs and Planet Vision Designs depending on how far out you want to stretch your imagination that day. If you don't happen to have a telescope in your backyard, take a look at the wonders of the universe from your kitchen table every day, and get a new perspective on the world around you whenever you like.